SP’s: Could you give a brief overview of Rockwell Collins and what it stands for? Colins Mahoney (Mahoney): When you think about Rockwell Collins, you think about aviation electronics and we are often referred to as a technology shop. This is very important for us moving forward in dual use of technology environment, especially as we try and take commercial technologies and apply them into the defence market. When you think of Rockwell Collins, you think of it as an avionics provider, communication navigation surveillance provider, and secure communications provider. We started like 80 years ago as a communications company and we have maintained the heritage and advanced the heritage. There are a number of things we do in aviation electronics, such as commercial entertainment systems in transport planes, in business airplanes, in flight entertainment, electro mechanical systems, pilot control systems on a Boeing 787 and more. Our portfolio includes core aviation electronics, displays, autopilots, flight management systems, communication navigation surveillance, and mission computers. We have head-up guide systems which we attach to the avionics bucket of goods. It is really a technology that is very familiar in the defence environment and is becoming increasingly popular in the commercial environment. SP’s: Besides aviation, could you indicate your footprint in the other forces and the entities at sea? Mahoney: Obviously, when you now talk about network-centric operations, we have got to have an element of ground activity, surface either army or naval. Targeting systems are a big deal for us and when you think of being in a coalition environment, it is important to bring all the forces to bear in the battlefield. We have a lot of targeting and joint fire capabilities in the domain of surface solutions in our government business. In naval of course there are satellite communication, sub net relays, ad hoc networks, etc it is all aviation electronics and how we tailor that to the ground environment. SP’s: Does the Boeing P8I have any Rockwell content? Mahoney: Yes everything including cockpit and avionics. Obviously from a Boeing standpoint it is a long history. That airplane comes with complete Rockwell Collins communication navigation surveillance system. It is max version, so when you get max version you get Rockwell Collins displays, auto pilot, and extensive flight deck capabilities. SP’s: This means that the involvement of Rockwell Collins is likely to increase in India gradually? Let’s hope battlefield management system (BMS) gets finalised and you get some good share from the market. Mahoney: That is what we are planning for sure. As new airplanes come into this market we are more often than not a big part of the C-17, C-130, etc. These carrier planes come in foreign military sales (FMS) environment and generally have got Rockwell Collins content. SP’s: Which is beneficial for your company – FMS route or the direct commercial sales (DCS) route? Mahoney: We are kind of agnostic. Our presence in India will drive results in either category. We think we are good and ultimately we cannot make you decide whether you want to procure via FMS or DCS. What we can do is make sure you are fully aware of everything we provide. At the end of the day, it is DCS or FMS, the teams in India would have done their work. SP’s: Could you outline the profile of Rockwell Collins, the range of technologies and services both in military and commercial markets? 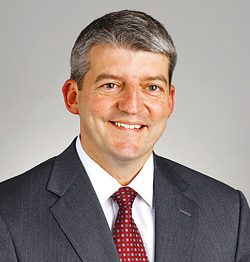 Mahoney: You will see Rockwell Collins increasingly operate in an open systems architecture environment which means we can develop something in commercial and use it in defence or conversely develop something in the defence environment and move it back into commercial because the underline architectures are using common communication protocol. We can basically move into a software environment wherein we change software applications and tailor to different hardware practices. Aviation, navigation and communication— we are a big player in all the three domains. We have been aviating with flight displays, auto pilots and flight management solutions. In commercial, you will see displays have trended from steam gauges to CRTs to LCDs to big LCDs and now touch screen LCDs. We are very big in the display systems business, auto flight, flight control, computing in a fly by wire environment, flight management. And in communications, we have all kinds of communications such as satellite communications, high frequency, VHF. In navigation and in surveillance, we are very big in weather radar. Weather radar is the baseline on many aircraft in commercial environments. We are big in air transport and in business aviation. We take our capabilities to both the domains. Add to that the head up guidance systems, pilot control systems, fly by wire technologies, etc. More recently, we will be growing and moving forward in information management. Increasingly, airplanes are operating in data environment which used to be just flight management system databases. Now it is synthetic vision, we have got remote diagnostics. How you communicate with those airplanes is a critical part in moving forward. All the core information management on airplanes like 787; A350 and infrastructure comes from us. Back of the cabin which is a different environment and we have been on a bit of a journey on that. We have acquired companies for that and have rolled out with latest generation of products for business aviation. With regard to defence, we have very strong presence in fixed- and rotary-wing aircraft. Helicopters radars, we are pretty much on AgustaWestland in communication and surveillance and they have shown proven capabilities in flying airplanes and battlefield systems. In securing communication environment in network-centric operations we are a big player. There is an increasing demand everywhere, including India. Targeted solutions, electronic warfare solutions are some of our defence capabilities. Rockwell Collins is also into simulation and training. We have acquired our way into this domain and have integrated both government and commercial simulation. We bought NLX in Washington, DC. We package all together in military training and commercial. Three months back we signed joint venture with Blue Sky in China for commercial applications for single aisle airplanes. IAF for communication, navigation in platforms such as C-130, C-17 and future Helos (Apache and Chinook). We have many customers with our ARC 210 and Talon radios on platforms such as the DO 228 for the Navy. 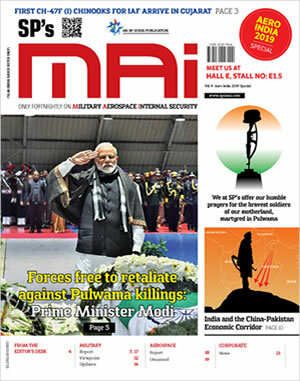 As well as electronic counter-counter measure equipment and GPS on aircraft use by defence forces through our customer Electronics Corporation of India Ltd (ECIL). We do face more challenges on the defence side related to indigenisation, export laws and only in recent years are being able to do defence business with India. It does take time to build relationships and make progress in new countries as we have seen in Brazil and the Middle East. For example, we have been in Brazil for many years, mostly doing commercial airlines work and supporting Embraer. However, recently we are making a great deal of progress with the selection of our Pro Line Fusion flight deck on the KC 390 and the selection of our Talon radio as the standard for Brazilian Army Aviation. We believe we will succeed in India as well. SP’s: Companies like yours are inventing technologies, reinventing technologies. How much do you spend on research and development? Mahoney: We spend about 19-20 per cent of revenue that is one billion dollar in range. We are leading the way in spending in new products and new programme developments, there could be some customer funded element to that. In the last five-six years we are in the 20 per cent range and it is significant and our customer base appreciates that. When they bet on us as aviation electronics provider, products which are not easily changeable, the customers would want enduring and cutting-edge technology. We are focused and proud of making the customers competitive in defending nations or having a better airplane. SP’s: Could you tell us about the design centre in Hyderabad, what is the agenda and is it an extension of your research and development (R&D)? Mahoney: The design centre is the operating arm of engineering business. They are very involved in executing existing programmes. We have added now an advanced technology component centre where we are looking at future technologies in concert with Cedar Rapids. We are 600 strong and we really couldn’t be happy with our five year journey. We opened in 2008. They are involved in display work, simulation work. Lot of business activities are done here. Something as visible is the A350 information management in which the IDC had a huge role to play. They recently featured in the Chairman’s team award for the three entities (Cedar Rapids, Airbus and IDC Hyderabad) which came together. We are performing well on A350 in a trail blazing capability. This isn’t being done before-- information management onboard. It has been great execution and it is part of our India strategy. We have access to top tier talent here and it is plentiful here than in the US. In aviation, we have access to top talent which is coming out of the universities here. Our talent turnover is very low compared to India. We have been delighted about the IDC and our turnover is in soft double digits. Our vision for Rockwell Collins’ India Design Centre is to support local and international governments, aerospace OEMs, and contractors with engineering design services and systems that can help customers achieve a shorter time to market, at a lower programme or project life cycle cost, with the highest quality innovative solutions. SP’s: Rockwell Collins service and support network spans 27 countries. What has been the expansion strategy and which are the target markets for your company? Mahoney: Our international service solutions division has been serving since inception. We are present in 27 countries and have service centres in 13 countries. Our expansion strategy is to communicate more effectively. Nowadays, logistics is far more advanced. Our focus is on state-of-the-art asset management programme. Let’s take the example of Air India which has entrusted to manage all their avionics assets on the Boeing 787. They have decided not to own any but we guarantee availability. They leave everything to us —logistics, management, maintenance repair and overhaul (MRO). In military, we have an offering called Flexforce which is performance based logistics. We manage all the assets and work in an availability environment. Everybody is rewarded for success and the product is there when you need it. A performance based environment is better way than the historic approach in which if a part breaks, the customer sends it to the company and is charged for that. The performance based approach is cost effective and is helping us expand our customer point touch network. In business aviation, which is growing in India though there infrastructure challenges, we have appointed partners and trained them. We have a tie up with Air Works for our service infrastructure. We got about four engineers who work with these entities to give us an extended footprint. Global asset management pool is important for us. We move spare parts to make them readily available to the customers. We are efficient in making them available. We take about 82 hours to repair something across the board and spare part availability allows us to be efficient with our global asset pool. It is an important tool to drive customer affinity. We earn our way on the airplanes and the trust of our customers helps in building future relations. We have a multifaceted expansion strategy for our Services Solutions business. Today, we have close to 8,000 aircraft under performance based agreements. More than 1,000 parts/repairs/exchanges shipped every day and we have over 3,000 satisfied customers. We plan to grow our Service Solutions business by offering customers—in mature and new growth markets—these flexible, performance based programmes, such as FlexForce for military customers, dispatch for next generation commercial aircraft, and Corporate Aircraft Service Programs (CASP) for business aircraft. With these programmes we can provide guaranteed availability and performance, budget predictability and priority service. We are also planning to grow our Service Solutions business by investing in and expanding our inter-trade subsidiary. Inter-trade offers competitively priced, recertified aircraft components for sale, exchange or lease. Our extensive inventory covers multiple military and commercial equipment manufacturers and aircraft platforms. We are buying more aircraft to tear down and moving into the engines parts business. This is a growth area for our company. SP’s: Which country in Asia is your topmost strategic partner as of today? Mahoney: We are laser focused. Our traditional markets are flat. The US domestic market is flat, the developed countries are flat. In Asia Pacific we are focusing on Australia, Singapore and South Korea. They are strategic in nature. In Australia we are focusing on training solutions, patrol system surveillance and that’s been a huge success. From the defence perspective, India is in the top of the list and commercially it is China with the development of C919 and J21. There are two joint ventures in commercial aviation in China. With the refining of the Defence Procurement Procedure, India is where opportunity exists for us and that’s why the level of focus from our company. In South Korea, I will take a European analogy. Turkey for example years ago embarked upon making their industry indigenous. Unfortunately for us, we did not see that happening and we embarked upon the journey a bit too late. We weren’t part of the infrastructure development and we tried to put in niche products. In Korea, it is fast forward, it looks like Turkey of 10 years ago. We started developing assets for Korea and help develop indigenous capabilities. India’s defence industry aspires to become indigenous. The last DPP was very specific in terms of source selection. We have got to be part of infrastructure aviation by not just bringing products but partnering with companies in India to accomplish the mission. SP’s: With India high on the priority markets, what is the marketing strategy in India? Mahoney: Clearly our IDC is a real world example—access to talent, access to markets. Indian industry will view us favourably as we are investing in the country. We are doing it for India and elsewhere. There is too much talent in this country. India is a key market for Rockwell Collins. Increasing air traffic and ongoing regional security threats are driving spending on programmes in both commercial and government sectors. Rockwell Collins sees significant business opportunities for communications upgrades, network-centric warfare, avionics, commercial aircraft systems, business aircraft systems, simulation and training and service solutions. SP’s: India has been fine-tuning its offset and defence procurement procedures. In your view, are they creating a friendly environment for global companies to participate? Mahoney: The DPP policy is crystal clear. They are steering your acquisition approach. That is different from the turkey example. It’s written down with clarity. Of course you want to be self sufficient considering relations with China and Pakistan. We understand you need transfer of technologies. It is perfectly clear for us. We don’t find it unfair. We fully expect many of the future programmes in India to be “Make India” programmes, so teaming with Indian partners has been and will continue to be a key element in our strategy. Our US Government also values India. However, there are still some challenges with bringing some of our products to India. While we plan to win defence business in India working through partners, and are continuing to develop exportable products, we’re also hopeful that India and the US will ultimately come to an agreement regarding communications and information security. We do have a strong offset strategy across Rockwell Collins which we can tailor depending on the requirements and initiatives within each country where we do business. As we continue to win business in international growth markets, we are prepared to provide the most attractive offset programmes which truly are a win-win for Rockwell Collins, our partners and our customers. SP’s: Could you indicate what specific areas Rockwell Collins has identified for business development in conformity with Indian policies? Mahoney: We opened the business development office in Gurgaon about 18 months ago. What we strategically focus on to understand the needs of the country and India is an emerging country of interest for us. We have to understand the business here than sitting in Cedar Rapids, not just sales and marketing, engineering and programme management. It makes us collaborate with partners in India and to understand needs and to help Indian entities know what is available. The Hyderabad centre is a cost effective place to do business. As regards specific business development standpoint, the journey that you have set up on advancing your network-centric communication and what we do fits very nicely with that. The partnership with Tatas on software defined radios (SDRs) are very good examples of defence business partnering. The company’s strength in network-enabled communications, advanced, integrated avionics and communications systems for fixed- and rotary-wing aircraft, precision navigation and nose to tail systems for unmanned aerial vehicles (UAVs) aligns well with India’s needs. Leveraging commercial systems for military applications, we can offer faster time to market and lower cost. SP’s: Apart from Air India, who else have you partnered with or have strategic alliance? Mahoney: For us every new airplane bought is a new day. Historically we grew up with 737 and MAX.I In terms of our partnership we have wonderful relationship with Jet Airways. All the others such as IndiGo, SpiceJet are all selecting Rockwell Collins equipment—radar, communications. We are proud of the relationships with these companies. SP’s: Any partnership with Defence Research and Development Organisation (DRDO)? Mahoney: As part of bringing advanced technology with IDC we don’t have any ongoing programmes with DRDO. Our partners are tied to DRDO and we have a good sense of what that means to us... we are mindful of that. SP’s: Could you tell us about the synergies between commercial and military systems and how this compatibility has given an edge to your company? Mahoney: Dual use technology is a term which we use in the US. It gives us advantage of exportability. We are about 50:50 government and commercial and with the recent acquisition, if it goes through, we will be more commercial. If you go back 10 years, the flight deck in the military market had their own programme. Now the architecture is to have fusion products, components which are used in business aviation, air transport, modifiable by software. For instance take Embraer’s KC 390 where there is fusion on the tanker as well as on the business jets (Legacy series) It is the same story on 767 tanker making it compatible on other aircraft. Dual use technology has been serving us very well. For example, Rockwell Collins offers our Pro Line family of commercial integrated flight deck systems with advanced capabilities for both commercial and military customers around the world. Rockwell Collins’ latest in the Pro Line family of integrated avionics systems is Pro Line Fusion. This system offers customers the opportunity to leverage the best, advanced capabilities in commercial and business aviation technology for military aircraft applications. Pro Line Fusion is already being developed for multiple business aircraft as well as the Brazilian Air Force’s KC-390. Pro Line Fusion’s architectural flexibility enables a versatile, role-adaptable flight deck to serve both military and commercial customers. SP’s: Could you give us indication of strategic alliances with airlines in the region, are they growing? Mahoney: It’s a new day with the 787 and A380 fleet. When a company buys a new airplane without any fittings, the airliners have to think of infrastructure and MRO or whether they need to outsource that to somebody else. At least half of them partner strategically and Rockwell Collin takes on that responsibility. Air India is an example of that and examples in China, LOT Poland and others globally, who do it for good cost effective reasons. With the exchange rate challenges and fuel burn, it makes sense to have these in place here. I put that in category of strategic partnerships and companies enter into preferred supply agreements, sometimes extensible to joint venture. We have a joint venture for MRO in China. They are all different variations of partnerships. We have had a long-term relationship with HCL and plan to continue that relationship at the same time we are growing our India Design Centre. The IDC is a channel for us in the India market and was started to support specific programs in India and from across the globe. We will continue to tap HCL and its talent base to help manage the ebb and flow of projects and programmes we have to help manage high volumes of work. SP’s: Are you expanding your service network to turnaround time in Asia Pacific? Mahoney: From a pure turnaround standpoint, 82 hours average is good? I want to spend more money on global asset management, an infrastructure which enables our customers to manage assets effectively. There are challenges of customs. India is not as bad as China. Our focus and our decisions are driven around store-based location where we should have service infrastructure so as to make it as efficient at the technician level as it can be. In general, our commercial service solutions customers are growing and we now have more than 8,000 aircraft on performance based service contracts. We have been expanding our Service Solutions network in Asia-Pacific through partnerships, JVs and global asset management processes, systems and facilities. SP’s: India needs state-of-the-art technology and the user perception is that we don’t get top-end technology. The technology provided by Rockwell Collins will be first hand or second or third hand? Mahoney: In our case we are quite often in the environment of being at the forefront of technologies. Some we got, some are maturing. We bring that. I think some of your comments are around protection strategies. We have distinct strategy to grow securitisation of communication in India. SP’s: Is Rockwell Collins working on any technology breakthrough which can benefit our forces? Mahoney: One of the really good examples is the HeliSure product line which has had good experience in fixed-wing and fast flying markets. HeliSure synthetic vision systems provide situational awareness which is far greater. In rotary-wing when there is a blow out or a picture of sand or dust swirling around, our technology gives situational awareness which is highly valuable. Tcas 2 is of situational awareness in fixed-wing aircraft which helps in avoiding traffic collision as it gives a resolution advisory. Those are types of examples we have been investing in to develop capabilities to make our operators lives easier. We are developing compact head up guide systems. These capabilities are in the purview of the big airplanes and small airplanes and we have cruised comfortably. Here is one good example; we just launched a new product line called HeliSure primarily for helicopters. Whether it’s emergency medical services (EMS), law enforcement, search and rescue, or any number of other demanding mission profiles, the very nature of a typical helicopter mission means the aircrew must operate in potentially dangerous environments. HeliSure is the only completely unique portfolio of products that combines 3D visualisation, displays, sensors and databases together to provide unprecedented situational awareness for helicopters. HeliSure’s scalability and flexibility make it virtually platform agnostic. Sensor data is delivered in real time through an intuitive user interface that features 3D visualisation for information that pilots can easily, quickly and effectively process. The first two products of the HeliSure family are helicopter synthetic vision system (H-SVS) and helicopter terrain awareness and warning system (H-TAWS). HeliSure could certainly benefit Indian defense forces. SP’s: Could you tell me about Service solutions per se? Mahoney: When we talk about service.. Let’s look at MRO and it means fixing their boxes, reliability, piece parts availability, some customers need indigenous capability and make them to control their inventories. Relatively recent we acquired Intertrade which has expanded 10 fold. In that business we acquire C-19, f16 and tear them apart... we do turnkey management programmes for the customers and we have turnkey maintenance. The engine business has just taken off...... the whole commercial air transport of high fuel and low financing costs is making these planes retirable much earlier. We are buying engines from aircraft such as 737, A320 and we fly them to the US and strip them down. That business has taken off well. We got about 2500 people in this business and it drives significant chunk of revenues. SP’s: You must be excited about P8i, C17, C-130.... these must good signs of development? Mahoney: Every time we come here we get excited. We have been learning to be patient and persistent. Rockwell Collins being part...we do not take anything for granted in this line... we are going to earn here and we are going to value add for the country... that is the essence of partnership. We believe that we have to demonstrate a value proposition to our partners. Historically many US companies often ask what Indian companies bring to the table. We cannot think like that... that is horribly arrogant. We look at it the other way ... for instance what we bring to Tata.... It is this which makes partnerships work.